On June 25, 1978, Gilbert Baker unfurled his first two rainbow flags at the San Francisco Gay and Lesbian Freedom Parade. 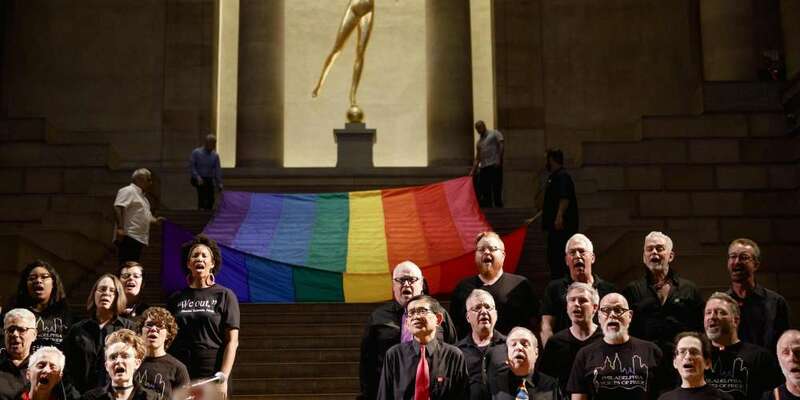 In honor of the 40th anniversary of that event, the Philadelphia Museum of Art has put one of Baker’s rainbow flags on display. This Wednesday, there was a ceremony to celebrate the rainbow flag and Baker’s connections with Philadelphia. The flag on display is similar to the same kind of rainbow flag you can purchase and display today. Baker specifically didn’t trademark his design to make sure his symbol was accessible to everyone. But this particular flag is on loan from a private collection, and was purchased from Gilbert Baker’s own line of flags, which were made in the United States with union labor. Michelle Millar Fisher, the Philadelphia Museum of Art’s Louis C. Madiera IV Assistant Curator of European Decorative Arts, first hanged the flag on the parade’s 40th anniversary. Though this flag isn’t one of the historical Gilbert Baker flags, one was unfurled at Wednesday night’s celebration. That flag — complete with all eight stripes from Baker’s original design, including a pink and light-blue stripe that were later removed — was provided by the Gilbert Baker Foundation from its collection. The ceremony also featured the Voices of Pride choir, remarks from Amber Hikes from the Philadelphia Mayor’s Office and Fisher. A rainbow cake and cupcakes were provided by Cake Life, a local LGBTQ-owned vendor. Baker’s original rainbow flag design included eight stripes, each with a different meaning. Pink stood for sexuality, red for life, orange for healing, yellow for sunlight, green for nature, blue for magic, indigo for serenity and violet for spirit. The modern flag, however, only has six colors. Pink was the first to be removed when the flags were first being created commercially — not out of any censorship, but merely because the hot pink fabric was too expensive. Indigo was next to go, in 1979, to make the colors of the flag equal, as the San Francisco Gay Freedom Day Parade committee planned to hang the flag in two halves on Market Street light poles. The rainbow flag has many connections to Philadelphia. Philly was the first city to add black and brown stripes in honor of LGBTQ people of color. Baker himself also referred to himself as “the gay Betsy Ross,” and worked with the Philadelphia chapter of ACT UP. 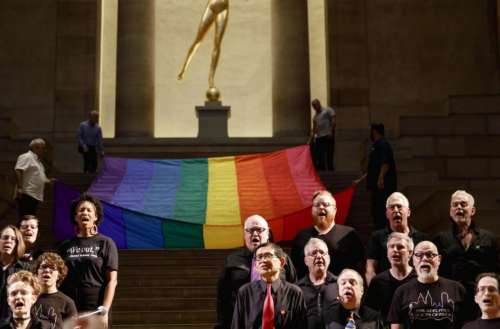 The Rainbow Flag will be on display at Gallery 123 of the Philadelphia Museum of Art until July 8, 2018.